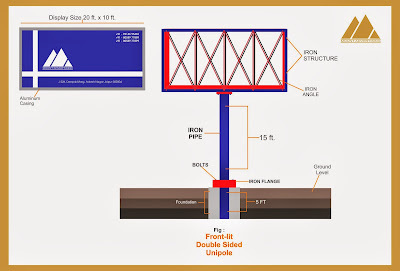 Uni-pole (or mono-pole) sign is basically an advertising sign (usually billboard) frame structure mounted atop a single steel pole or column. The single pole proved to be a common technical solution that makes a billboard visible alongside highways or roads. The Uni-pole is a large-format billboard type placed atop a very high pole. Its effectiveness is enhanced by the fact that this billboard can be seen even from long distances. There are two options when it comes to illumination: this can either be a light box or front-lit for versatility. A uni-pole is another tool for advertising. It is the cousin of "Hoarding". Sometimes, consisting of two or three large rectangular boards sitting on a single pole. Yet, Uni-poles are very delicate advertising tools, because the message that the advertiser has to deliver must be very clear considering the uni-pole's height. By this we mean, first of all, as for the display it has to be clear and simple, with few colors, yet catchy so it would attract sights without being very distracted by lame details. Second of all, the font used also has to be neat and readable in order to deliver the message correctly. The special thing about uni-poles is that its rectangular shape gives the advertisers an opportunity for more creation. Also, you can add extra display elements to it. Mount Advertising Services fabricates V Shaped Uni-pole, Double-Sided Uni-pole, Revolving Uni-pole & Also as per client's specification.